Bake at 375°F 40 min It’s odd, but it usually needs the whole 40 min – but if your oven runs hot, check it at 35min – always a good idea at any rate. Double the recipe – use a 9×13 deep dish pan – cooks in the same amount of time. Pour batter into muffin pans – bake at 375° for 14-18 minutes (test with wooden pick- should come out clean) don’t over-bake or they’ll get dry. The teenagers love these fudgy spelt brownies… best served with icecream on top, and a drizzle of gently heated hazelnut spread (such as nutella). Can be made with all organic ingredients. Thoroughly beat oil & cocoa powder until completely blended, add sugar, blend well, add eggs, vanilla and clubhouse rum, beat til creamy. Add corn flour and baking powder and nuts. Stir til just mixed. Pour into greased 8x8x2 pan. Bake in slow oven 325°F oven for 35 min, until toothpick inserted comes out clean. Alternate frosting options: just a bit of powdered sugar dusted on top by using a sieve to powder evenly. If you like thicker filling, the filling recipe can be doubled. b) any type of spelt flour can be used – whole, light, all purpose etc. Baking with spelt is easier than you might think. Children and most adults can’t tell that it’s made with spelt and not regular flour. Scoop out using 2 tablespoons size scoop (each cookie is 2 tablespoons of dough) – Looks like an ice cream scoop but slightly smaller. remove from oven slide parchment onto the racks let cool for 2 min, then transfer to alternate wire racks off the parchment using a flat lifter to continue cooling. Makes approx 18 gourmet sized cookies. For oatmeal raisin cookies, simply substitute the chocolate chips for Thompson raisins. For double chocolate cookies add 1/2 cup good quality cocoa powder (omit the cinnamon). For triple chocolate cookies add 1/2 1/2 cup good quality cocoa powder (omit the cinnamon) AND 1 cup white chocolate chips. For ultimate cookies add 1/2 1/2 cup good quality cocoa powder (omit the cinnamon) AND 1 cup white chocolate chips and 1/2 cup peanut butter or skor chips. 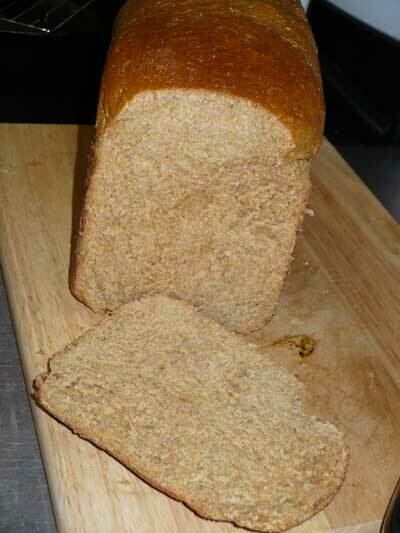 This recipe for us rises above the bread machine pan, and no wheat flour! Put ingredients in bread machine pan in order listed. 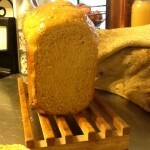 Use the “light crust” 2lb basic white cycle (not rapid) as spelt and kamut don’t like to be over beaten or over baked. The malt powder is important, because it helps the dough to rise. Humidity will change the moisture content of the flour, therefore sometimes it may need a little more flour, and sometimes it may need a little more moisture. Since we don’t eat a whole loaf in a day, once cooled, we slice it up right away, and put it in the freezer. It will stay as fresh as the day it was put in. We usually use it up within a week or two. Use grain cycle on bread machine to completion OR Remove at “last knead” Roll out like a rye loaf, place on stoneware or cookie sheet cover & let rise 30 min & bake @ 350 °F, 30 min. 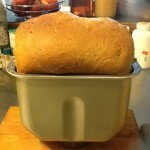 Cook 10 min longer in a loaf pan.